Scientists were worried in 2013 when they found what seemed to be Asian carp eggs and late-stage embryos in the Upper Mississippi River near Lynxville, Wis.—250 miles north of the last known reproducing populations of the invasive plankton eaters they’d been battling for 20 years. Their worries, reported to National Geographic’s worldwide audience in 2014, turned out to be premature, if not unfounded. U.S. Geological Survey biologists analyzed the samples and determined they were likely from a native North American species in the same carp family. Since that time, reproducing populations of silver, bighead and grass carp have not been found north of Lock and Dam 19 at Keokuk, Iowa, but adult members of those species continue to find their way further up the Mississippi and tributaries. An angler caught a silver carp last June that somehow got past three sets of locks and dams and an electro-barrier in the Illinois River to swim within 9 miles of Lake Michigan, said Kevin Irons, the aquatic species program manager for the Illinois Department of Natural Resources. 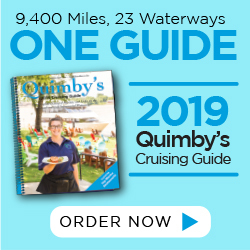 The leap-prone silvers, a hazard to powerboaters, are being caught on the Mississippi as far north as the Twin Cities. A commercial angler caught a 33-inch silver and a bighead in the St. Croix, just upstream from its confluence with the Mississippi last March, reported the Twin Cities Pioneer-Press. A bow angler, fishing in a private gravel pit near Redwood Falls, southwest of Minneapolis, shot a 47-1/2-inch, 62-pound bighead, the state’s largest Asian carp on record, last June, according to the Minnesota Department of Natural Resources. That’s 80 miles upriver from previous bighead catches. Bighead and silver have long been used in sewage treatment lagoons in Arkansas, and the people who had the fish didn’t believe they would be able to reproduce in the wild. “Biosecurity really wasn’t a word back then,” he said. Now a fourth Asian invader, this one equipped with shell-crushing pharyngeal teeth, has recently joined the fray. There’s a $100 bounty out for black carp, which commercial anglers are catching on the middle Mississippi and lower Illinois, and have been found in reproducing populations near St. Louis, said Irons. Control, not eradication, is the goal, according to Irons and other fish and wildlife managers involved in Regional Asian Carp Coordinating Committee, a 27-member partnership of state and federal agencies. 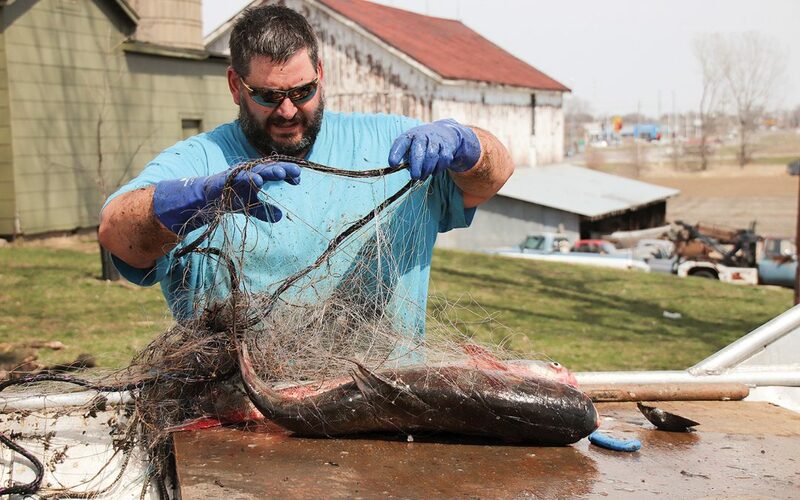 Contracted commercial fishermen, another sore spot for Shafer, take out about 3.5 million to 8 million pounds of invasive carp from the Illinois River each year. That could go as high as 20 million pounds per year, Irons believes. “We wouldn’t eradicate them but we could reduce them until they aren’t 70 percent of the biomass, down to maybe 20 percent,” he said. Shafer prefers to let nature find its own balance, but that’s not likely considering the safety threat of silver carp to boaters and worries that the invaders will spoil the Great Lakes fishery and outcompete native species in the entire Mississippi basin. Congress appropriated $2.37 million in the U.S. Fish and Wildlife Service’s fiscal year 2015 budget for Asian carp prevention in the upper Mississippi and Ohio basins, then upped it to $2.62 million in FY 2016, and tossed in another $700,000 in FY 2017 for development of technologies that are transferrable to other basins and may be used against other invasive species. The money goes for research projects ranging from Fluvial Egg Drift Simulation to Mobile Hydroacoustic Surveys. Removal methods range from electrified butterfly trawls to toxic microparticles and contract anglers. “As we explore some of these new deterrents and tactics, we’re in a better position to take the fight to the fish,” said Mike Wiemer, a U.S. Fish & Wildlife fishery biologist and co-chair of the regional multi-agency effort. The challenge is huge, said Mark Cornish, supervisory biologist for the Rock Island Engineer District. “There are literally millions of fish out there.” The mid-June aggregation of spawning Asian carp can be “miles long” below Starved Rock Lock & Dam in central Illinois, he said. Black carp reach tremendous weights, such as the 115-pounder hauled in near Thebes, Illinois. “They haven’t reached full size. They are going to get bigger,” predicts Chapman. “After eight years of concerted effort, we can tell you where fish are and where they aren’t,” said Irons. “We’ve reduced the leading edge in the Illinois River by 93 percent. We’re trying to duplicate our successes on Mississippi River.” He agrees with Shafer that developing markets is a big part of the solution. That would suit Clint Hall, a part-time commercial fisherman in Ft. Madison, Iowa. “Over the years, they’ve gotten thick,” said Hall, who gill nets carp and other fish in the Mississippi with his two sons. He doesn’t see that the Asians are crowding out any native species, but he’d like to get a better price for those he catches. He sells catfish to Shafer’s Ft. Madison market for 65 cents per pound, but gets only 20 cents a pound for grass carp and a dime a pound for bighead and silver.